Just when Kelsey is finally fitting into her new California life, C. J. Logan comes along. He?s hot, popular, and revered as the best skateboarder around. Girls want to be with him, and boys want to be him. And Kelsey is lucky enough to be his girlfriend. But when she decides that their relationship is over, she could not have imagined what would happen next. With rumors flying, she is forced to figure out who her true friends are and, more importantly, who her true self really is. 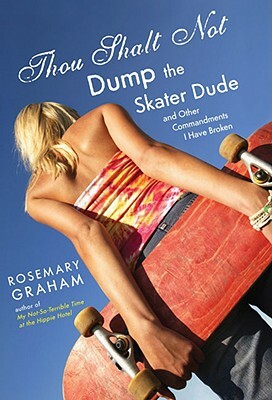 Rosemary Graham is the author of the young adult novels THOU SHALT NOT DUMP THE SKATER DUDE (AND OTHER COMMANDMENTS I HAVE BROKEN) and MY NOT-SO-TERRIBLE TIME AT THE HIPPIE HOTEL, both published by Viking. Her essays and commentaries have appeared in the San Francisco Chronicle, the Santa Monica Review, and on National Public Radio's "All Things Considered." She teaches English and Creative Writing at Saint Mary's College of California and lives in Berkeley with her husband and daughter.